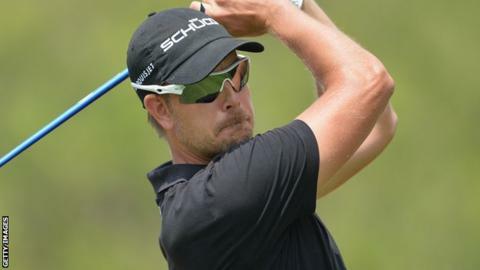 Henrik Stenson has won another title after being voted the European Tour's Golfer of the Year for 2013. The 37-year-old was the unanimous choice of the selection panel after a stunning and trophy-laden campaign. The Swedish player won the money list titles on both sides of the Atlantic, was runner up at the Open and third at the PGA Championship. Stenson began the year ranked outside the top 50 but his form means he heads into 2014 as world number three. In the standings he trails only Tiger Woods and Masters Champion Adam Scott. It took a runner-up finish in Houston in early spring to enable the Swede to force his way into the field for the Masters in April. "That was a big one in terms of how my season shaped up," Stenson said. "It is a big honour to be voted Race to Dubai golfer of the year. It just reflects the stellar year I have had. You can call it a dream season, the year of my life, whatever you want. "It has been an unbelievable year and I'm delighted to win the award especially as I'm the first Swede to do so. "You look at the past winners of the award and most of the greats of European golf are on there which just adds to the prestige of winning it," Stenson added. In September he claimed the £6.3m FedEx Cup play-offs with victory in the Tour Championship in Atlanta. Stenson then capped the European season in Dubai with a closing eagle for a 64 and six-stroke triumph. Those wins helped make him the first player to secure the top bonus money from the PGA Tour play-offs and Europe's Race to Dubai. "Winning the DP World Tour Championship in Dubai, where I'd made my home for 10 years, and in the style I won it in front of so many friends and family was something I will never forget," Stenson said. "I'm not sure how I top it to be honest. I am not sure many people will get the chance to do what I did this year but I just need to keep working hard and pushing forward. "The majors are the biggest goal for me now and if I can continue to play at the level I have, then I feel I can have a pretty good shot at them."